...a word from Turlock USD Food Service Director Scott Soiseth. 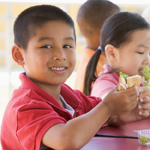 In order to better serve the nutritional needs of our students, Turlock Unified School District Child Nutrition Department launched a new way of thinking about school lunch in the fall of 2007. We continued our commitment of providing school environments that promote and protect children's health, well-being, and ability to learn by supporting healthy eating, while meeting strict government nutritional guidelines. However, with the launch of our brand and product line called real.fresh, we offer students an even wider array of fresh, healthy, tasty, and high quality menu choices. The real.fresh brand captures the essence of student preferences and requests that we have gathered through surveys and interviews with students. Our students show a very strong awareness of the importance of nutrition in their physical health, but they often struggle to make the appropriate choices. We market to our students, who are our clients, with real.fresh posters, staff uniforms, speed line graphics, USDA guideline signage, full color menus, menu stands, product packaging, and a Web site at cnd.turlock.k12.ca.us. The real.fresh brand offers a greater range of fresh choices that balance great taste and good health, while also offering a greater degree of nutrition education to help students build a healthy lifestyle. The real.fresh menu offers desirable meal options, giving students a fresh, delicious, nutritionally balanced meal.